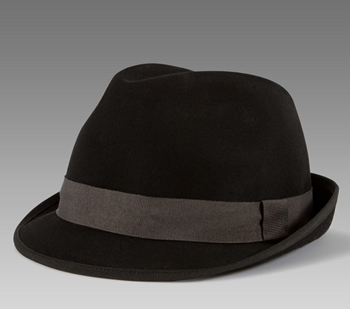 A Trilby Hat or just Trilby is a type of short-brimmed Fedora and is distinguished by a very narrow brim that is sharply turned up in the back and a short crown, which is pinched in the front and indented into a teardrop shape in the centre. The hat’s name derives from the stage adaptation of George du Maurier’s 1894 novel Trilby; a hat of this style was worn in the first London production of the play, and promptly came to be called ‘a Trilby hat’. The Trilby is traditionally made from rabbit hair felt, but is now sometimes made from other materials, including tweed, straw, and wool. The hat reached its zenith of popularity in the 1960s, when it supplanted the wider brimmed fedora with the lowering of the roofs of American cars made it impractical to wear a hat with a larger brim and tall crown while driving. It faded from popularity in the 1970s when any type of men’s headwear became obsolete, and men’s fashion instead began focusing on highly maintained hairstyles.